RTV’s Fusion single property website service provides an address-specific domain name for every real estate virtual tour listing. Single property websites, also referred to as individual property websites or property-specific sites, are a very useful tool when marketing a home online. The unique domain name is simply the property address—when typed into a web browser, it instantly pulls up that specific property details page or virtual tour. The choice is yours. Fusion’s information packed property detail page and virtual tour contains the photos, agent or home seller information, area map, MLS information, printable brochure, listing data, music or voice-overs, traffic reporting, and many more virtual tour features you’ll only find with RTV. Once the single property website is up and registered, the end user can place the domain name in a newspaper, magazine, or even on the rider sign, where many passersby can easily jot it down to look up later. Your virtual tour traffic reports will reveal how many hits to your virtual tour are coming from your single property website. It’s AMAZING! Single property websites are for everyone. 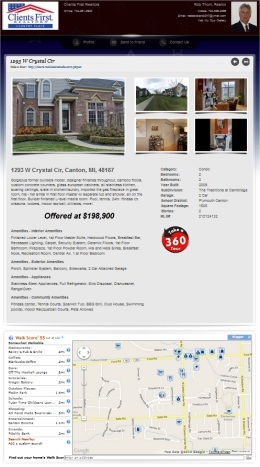 Are you a virtual tour provider or a real estate professional or looking for a unique way to attract more potential buyers? Are you a home seller seeking to catch the eye of more passersby? Have you been thinking about using an online service that charges outrageous monthly fees for simply registering your property specific website address and posting your snapshots? Look no further, as the all new RTV Fusion single property website registration is a mere $12.99 per year! Single property websites get results! NO MONTHLY FEES are required to keep your single property website up and running once it is posted and online. You can relax and let the powerful Fusion virtual tour system show you how much activity your getting and you’ll be free to promote your domain name as you wish. Our virtual tour system will take care of everything for you from start to finish. Finally, you have more ordering flexibility with our services. You can choose to order any type of domain name from a .com to a .info. Our system will allow you to register your domain name, point it to your online production or property details page in matter of minutes. Want to really show off your property? Order one of our popular AstroZoom space fly-ins for a mere $10.00. The possibilities are endless with RTV. What are you waiting for? Don’t let your listing in the paper or your listing sign blend in with all of the others in your area! You are just moments away from having the most powerful marketing tool available on the Internet. To start creating your single property websites today click the button below and create a trial account today. Order a single property website today!